Save up to $50 on your first visit with us! 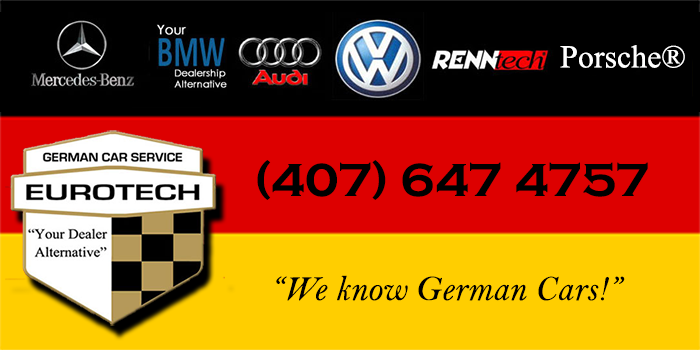 The Best German Car Repair Shop in Orlando. 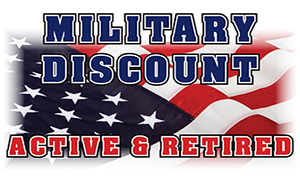 Save up to $50 on EVERY visit with us! 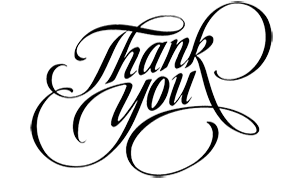 Read what our Customers say about our Shop and Team! 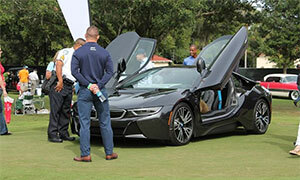 Save On BMW Performance Upgrades! 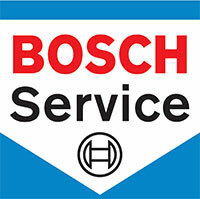 Servicing and Repairing Audi, BMW, Mercedes-Benz, Porsche® and VW vehicles for nearly 30 years! We know your're busy...save time by booking on line. Fast, easy and convenient. We will email you confirmation of the appointment. 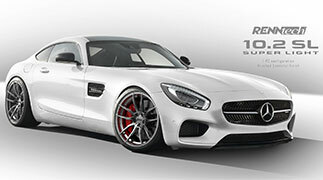 Eurotech, making the idea of enhanced driving fun and appealing to a growing number of BMW and Mercedes drivers! Thank you to our Veterans and those currently serving in the Armed Forces. We appreciate your service to our Country. 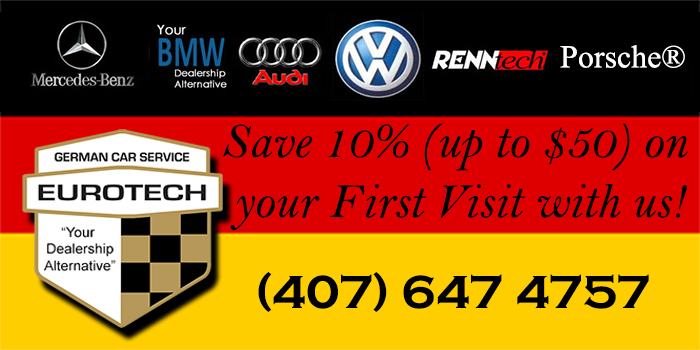 Are you new to the area or just bought a German Car? We would love to earn your business. 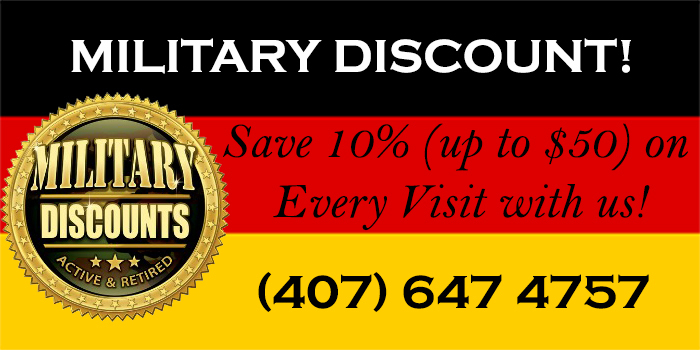 Save 10%, up to $50, on your first visit with us! 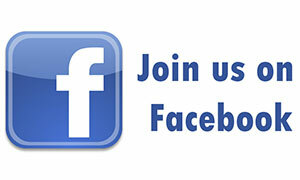 Come join us and lots of other Facebook Fans and Followers! Latest German Car news, pictures and updates from around the World. 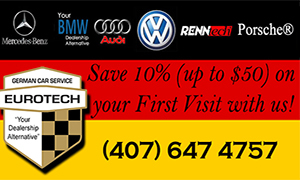 We have specialized in repairing and servicing Mercedes, BMW, Porsche®, Audi and VW vehicles for over 25 years. 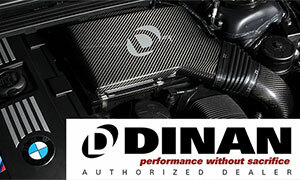 We also install after market RennTech and Dinan products. 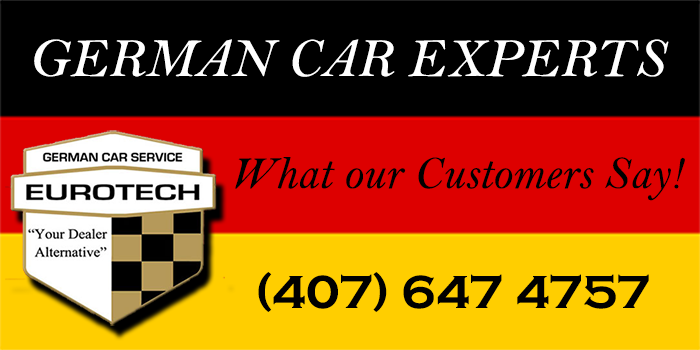 With a combined staff experience of over 100 years, our Factory Trained technicians working on Factory approved equipment, are why we are "The Dealer Alternative" in Central Florida when it comes to your German Car. Need Financing for your Service or Repair Work? Need help with untimely repairs or service costs? 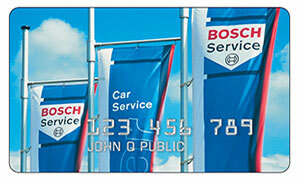 Apply online for a Bosch Credit Card. No Interest charges if paid within 6 months! 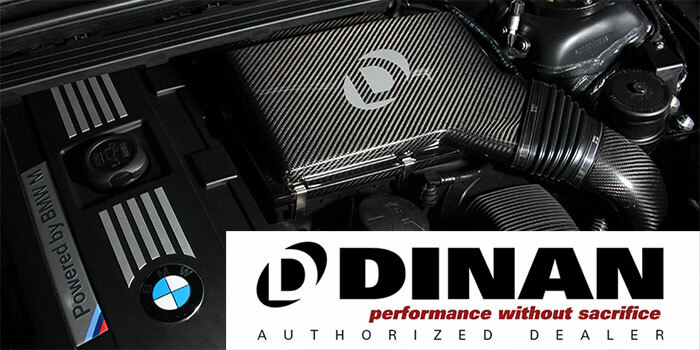 With Eurotech German Car Service, Central Florida's authorized Dinan BMW Performance Center is fully prepared to help you begin driving the high performance BMW of your dreams today.